This is the final installment of a series on leader development. For the previous posts, please read Leader Development: The Leeroy Jenkins Model and The Maker’s Motto. Over the last several weeks I’ve discussed leader development conceptually which is great, however it’s all useless if we can’t figure out a way to apply it at the unit level. Hopefully this week’s post provides leaders with the necessary tools to do so. Similar to developing a coherent national strategy, there are sequential steps we should take in crafting our unit leader development programs. The concept of ends, ways, and means provides one logical framework. Step one: Identify the desired ends. What are the outcomes I want to achieve? What is my desired end-state for the officers or NCOs I’m responsible for? Step two: Identify ways to achieve the ends. How can I work with the unit to achieve my end state? What are my lines of operation going to be? Example Ways for a Battalion commander’s Program: I will focus the development of my lieutenants by assigning them to various roles and responsibilities, training them, and educating them. Step three: List the means required to enable and execute the ways. 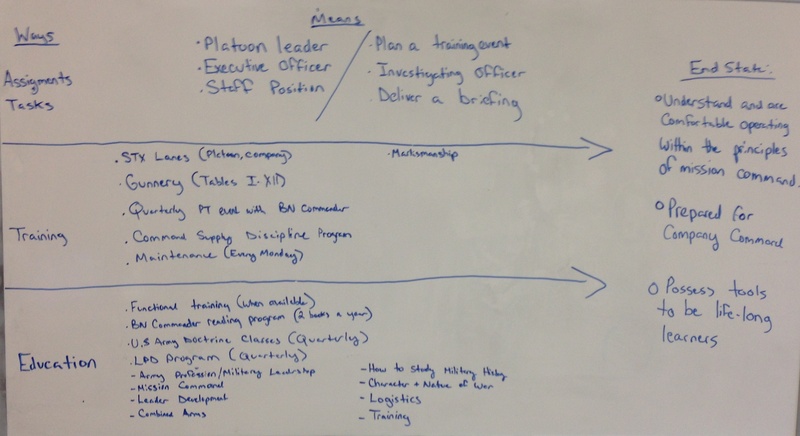 What types of assignments will my lieutenants need, and what tasks should they accomplish to be effective future company commanders? For example, in addition to being a platoon leader and executive officer, staff assignments may not only prepare them to understand the role of staffs play as a company commander, but also shape their understanding of mission command. What experiences through training will they need to understand mission command, and effectively command a company in the future? For example, as we enter an era of fiscal austerity, the importance of commanders maintaining property accountability systems will play an important role in the effectiveness of organizations. 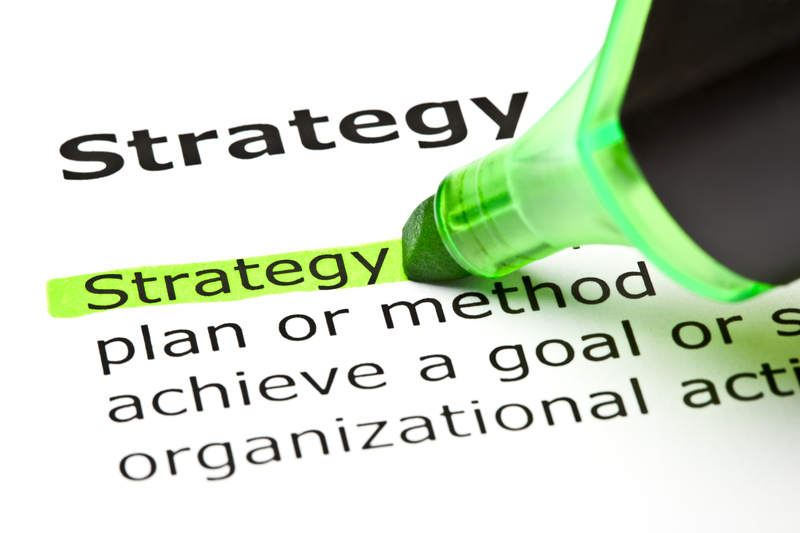 Lieutenants should leave the unit with a thorough understanding of Command Supply Discipline. What do they need to know in order to be prepared for company command and to be a life-long learner? For example, in addition to Army doctrine, lieutenants should understand the role military history plays in our profession. This topic could be one of the topics discussed at a quarterly LPD. Time is finite, so we must prioritize the means by which we want to develop our subordinates. We might also have to get creative in constructing meaningful experiences due to budget constraints. While there are about 1,000 great ideas out there, we may only be able to execute a few of them well within the scope of our time in command. There may not be enough key assignments for everyone, so we need to identify those who have the most potential and use those experiences for their development. Preparation and reflection must be the bookends of every experience we offer our subordinates. In Taking the Guidon, Allen and Burgess posit that “If leaders have thought through the upcoming experience, understand how it ties into the purpose of the unit and their own personal development, and know the doctrine that drives it, they will be in a position to learn a great deal.” By reflecting on experience, leaders are able to squeeze every ounce of learning out of that experience, akin to squeezing out a sponge full of water. Commanders should provide opportunities for reflection throughout assignments. Finally, and most importantly, a good leader development program must be well-thought out AND WRITTEN DOWN prior to taking command. To summarize this entire series on leader development in three sentences: (1) As leaders, we cannot adopt a Leeroy Jenkins approach to leader development. (2) We only have a small window in the careers of our subordinate leaders to develop them for future assignments (3) Using a good framework (ex. ends, ways, and means) to create a program ensures that we provide our subordinates with the right assignments, experiences, and education before that window closes. Previous The Weekend Safety Brief Must Go! Fate can be cruel or kind. While looking for a few Bn TOC ideas I managed to stumble into your blog. I happen to be asking myself how will I do a better job of mentoring my 17 captains than my “leaders” did for me. Looking forward to reading much more. Thank you for validating my weekly writing exercises with a single comment!